Many interesting and exciting records had gone before but, for the rest of '63, Marty and Jack were to combine their talents on two projects, Bobby Day's releases on RCA and Jack Nitzsche's burgeoning career as a solo artist on Reprise. The Marathons "Peanut Butter" was successful for Marty but his friendship and working relationship with Bobby Day, made at about the same time, was to prove far more productive. Following his move from Texas in the late '40s, under his real name Robert Byrd, Bobby Day had carved out a highly respected career as vocalist and songwriter. To document the group and solo names that Bobby recorded under is beyond the scope of this piece but checkout Dancin' Everywhere - The Bob & Earl Story for more info. "Bobby Day is the person who most helped me get into the music business. Here's what happened. He was at the Californian Club on Santa Barbara Ave. (Now Martin Luther King Blvd.) I walked up to the door one night and told the doorman, who was Bobby's personal guy, that I wanted to talk to Mr. Day about some music business. Now here's this white kid in a sports coat walking up to the door of this black nightclub and asking to meet with the headliner. He was laughing but he took me in and seated me at a table in the center of the room where everybody could see me. Well, I watched the show, feeling foolish but completely enthralled by Bobby's stage presence. When the show ended I didn't know what to do so I just hung around until this fellow, King, came and took me back stage to meet Mr. Rockin' Robin; Bobby Day. I was so nervous and I just blurted out that I wanted to produce records and I didn't have an artist and I hoped he would find one for me and we would make records etc. and guess what: Within two weeks he found me an artist, we made a record and sold it in a day to Dore Records. Bobby Day gave me my start. By the way, the artist was Bobby Relf; later to be the second Bob of Bob And Earl. The song was "Valley Of Hope". (released on Dee Dee 103) The first Bobby Day record I was involved with was "I Need Help" on Rendezvous. I LOVED BOBBY." Marty advised Bobby to move from Leon Rene's Class Records to Rendezvous and from then until the mid-sixties their careers were closely entwined. With Marty as publisher, producer, co-writer and label owner (sometimes all four) and Bobby often on the pen, always on the vocals (sometimes joined by Earl Nelson), many exciting records were created. Bobby's recordings under Marty's aegis, as expected, continued under a variety of alias and record labels. 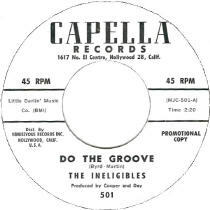 While still under contract to Rendezvous, Marty had Bobby and Earl Nelson into the studio to wax as The Ineligibles for his Capella label. "Do The Groove" / "Just The Things That You Do" were written and produced by Cooper and Day, with Earl Nelson included as co-writer on the latter track. Distributed by Rendezvous Records (I assume Marty had the green light for the project! ), both sides are fab and easily stand comparison with his other records of the time. Bobby recorded as Dave Rose, was one of 'The Wild Voices' for The Marty Cooper Clan RCA album, "New Sounds - Old Goodies" and did other vocal work for a variety of Marty Cooper productions including The Victorians. I'm sure there are other recordings awaiting discovery. The quality of Bobby Day's releases hadn't lessened, but the hits had. He had left Rendezvous in '62 but was still heavily in demand for his live shows, touring consistently all over North America. In Canada, a local R'n'B group called Les Gitans/The Chads backed him. The band, which had achieved moderate success in their homeland, and Bobby, got on well together. So much so that the band and Bobby joined forces as Bobby Day & The Midnighters and signed to RCA in New York for an album. Six months was spent on the LP but the public showed they were not ready for four white guys and a black guy sharing the same stage. Regrettably, the album was never completed. On his return to LA, Bobby was soon back in the studio with Marty. 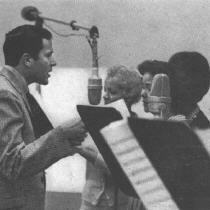 Four 45s were recorded and released on RCA in Hollywood along with one track "Old Town", and Marty believes two others, still in the can. All produced by Marty. Jack arranged three of the 45s and "Old Town". Perry Botkin Jr. arranged the other released 45, while details of the other two tracks are, hopefully temporarily, forgotten. Marty, Bobby and Jack all feature on the writing credits and as for the others involved: "The famous personnel include the Phil Spector rhythm section, The Blossoms, Leon Russell, Hal Blaine etc." All of the tracks are of the highest quality and feature some of the best that LA had to offer. The eleven sides would have made a fabulous LP but, sadly, it was never issued. Amazingly, even now, the only way to hear Bobby Day's RCA material is from these four original 45s. As I write, none are available on CD. And that's called sad. 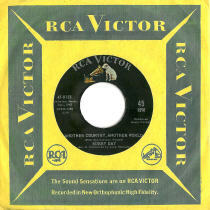 The first single, an inspired version of a track by The Crystals, "Another Country, Another World", came out of the traps racing. The original was produced by Phil Spector who co-wrote the song with Doc Pomus, although it's 'only' an album track, I love the song. The Crystals release is a slow, stately production and with Barbara Alston's lead vocal a very emotive reading. For Bobby's rich baritone voice, Marty and Jack took a tougher approach. Phil's subdued production is superceded, with the rhythm, strings, particularly the violins that really drive the tune, and castanets pushed to the fore. It's also cool to hear the 'LA Crystals', i.e. The Blossoms, backing Bobby as Dee Dee, Pat and LaLa do for Barbara on the original. This is my favourite cover of all the Phil Spector records. Flip the 45 and you have Marty Cooper's "Know It All", and what do you know, it's almost as strong as the a-side. This single should be in your collection. How and why it failed to chart originally is beyond me. Jack covered a few Spector recordings without the benefit of the master, and most of these were Crystals' tracks. Interestingly, as Mick Patrick noted in the CD sleeve notes, Jack also re-worked the intro to another early Crystals recording, the withdrawn "He Hit Me And It Felt Like A Kiss". Jack utilised the intro for Sherrell Townsend's "He Thinks I Still Care". Perhaps he was sending a message to Phil, "This is how it should have been done!" It's almost impossible to better these first two sides but the boys certainly gave it their best shot. The next 45 coupled "Buzz, Buzz, Buzz" and "Pretty Little Girl Next Door". The a-side was co-written by Bobby during his tenure as one of the founder members of The Flames/Hollywood Flames et al. It was a big hit for the group. Bobby usually took the lead vocal but in this instance his pal Earl Nelson did the honours. Perhaps this was one of the reasons Bobby re-cut the track at RCA? The arrangement is another nod in Spector's direction, only this time the influence is Bob B. Soxx and the Blue Jeans' "Zip-A-Dee Doo-Dah". Considering that Jack arranged, Darlene/Blossoms sang as the 'Blue Jeans, and both are also on this release, it is no surprise to hear what a great job was done. It works perfectly; the Spector-sound emphasised by Darlene Love's woah, woahs, the strings and castanets etc. Yet it loses none of the power of The Hollywood Flames original. The b-side, a mid-tempo number, has been picked up by the Northern Soul crowd and the single is apparently fetching up to 400 pounds on auction sites. It's a bit steep but they are two ace sides. For "Jole Blon (Little Darlin')", a Coooper - Byrd song, the musical geography shifts from New York's 'City Soul' and Los Angeles' Wall of Sound, to New Orleans 'Mardi gras'. The track is great fun with a good vocal from Bobby, easily holding his own against the trumpets, trombones, accordions and triangles. "Down On My Knees", a solo Nitzsche composition, is soulful. Bobby's performance amply displays his vocal prowess, while Jack's strings sweep in and out, conveying Bobby's sense of desperation as he realises he's lost his girl to another suitor. Jack wasn't available for the recording of Bobby's final RCA release, "On The Street Where You Live" / "When I See My Baby Smile", and Perry Botkin stepped into the breach. Marty and Bobby had no worries using Perry, who is a very skilled and talented arranger. A change of style for this cut. Both sides are poppier in tone, with "On The Street..." in particular seeming to prepare Bobby to compete with Bobby Darin on the 'lounge stage'. For "Old Town", written by Cooper & Nitzsche, Jack re-worked the backing track for his "Lonely Surfer" album. Given its 'Western' feel, mariachi trumpets, bells imitating spurs, blocks of wood as clip clop horses' hoofs, it's fun to imagine Bobby Day's vocal on the track. It's just a shame that we have to rely on our imagination! Frank Sinatra founded Reprise Records in 1960/61 but by the end of its second year Frank, Sammy Davis, Jr. and Dean Martin were off-the-boil, at least in 45rpm terms (they only had two top forty hits between them), and the label must merely have seemed like 'a good idea at the time'. Thank goodness for Lou Monte's "Pepino The Italian Mouse" cracking the Top Ten in December 62! The chart outings became more frequent when Jimmy Bowen was hired as producer. Jimmy's role at Reprise, besides working in the studio with a few of his 'favourite' artists, was more that of an old-fashioned, hands-off producer. Perhaps his greatest talent lay in choosing the right people and allowing them the freedom to do what he'd hired them for. One of his first signings, in early 63, was Jack Nitzsche as an arranger. 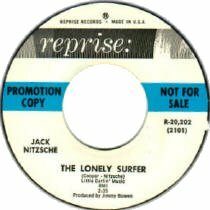 And one of his first Top Forty outings was Jack Nitzsche's solo instrumental "The Lonely Surfer". 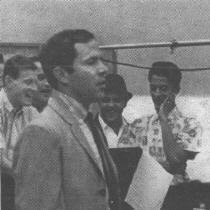 Encouraged by Jimmy to record some instrumentals, Jack told Ken Barnes in his Bomp! interview that he just wanted to play with the orchestra. Nevertheless he had fun and scored a hit. As was Jack's usual modus operandi, he left his choice of tune until just before the session was due to begin. Jack phoned Marty Cooper for some ideas, he obliged with the title and a hummed tune. Jack did the rest in the studio. Nitzsche was enjoying honing his skills with the orchestras used on Spector's and other large sessions. As to be expected, he didn't cut corners. His recording of "The Lonely Surfer" was BIG and although it predated even his score for "The Land Of The Giants", it was cinematic in its scope and atmosphere. The success of the single ensured Jack's swift return to the studio to record the "The Lonely Surfer" LP. As well as some popular tunes, including "Stranger On The Shore", "The Magnificent Seven" and "Ebb Tide", he took the opportunity to thank and tap the talents of some of his music biz pals. Tunes include Al Hazan's "Beyond The Surf", Phil Spector's "Da Doo Ron Ron", Lee Hazlewood's "Baja" and four tunes (a third of the LP) co-written with Marty. The previously noted "Old Town" I'd not suspected of having been intended as a backing track until Marty told me of Bobby Day's vocal . "Puerto Vallarta", a sort of "Pop symphony for grown-ups", echoes many of Spector's sounds without the 'easy' emotional pull of a vocal. 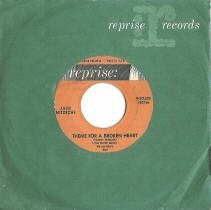 "Theme For A Broken Heart", with its plaintive violins, has one of the strongest melodies on the set and was possibly an inspiration for Mann and Weil's "I'm Gonna Be Strong" and/or Jagger and Richards' "Blue Turns To Grey". The two latter tracks were also released on 45s. "Puerto Vallarta" wasn't released until '65, backed with a new Cooper - Nitzsche tune entitled "Senorita From Detroit". Marty is unhappy with the recording, feeling it could have been handled better, but even so what a cool tune! The track is an invigorating weld of a fast-paced Motown-styled rhythm to a Latin bossa-nova. You need to hear it - works wonderfully! 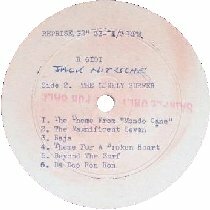 I'd guess recorded at the same time, another Cooper - Nitzsche instrumental remains unreleased, at least by Jack. Mike Edwards contacted the site sometime ago to inform me of David Rose and his Orchestra's recording of "The Blow Up", written by the pair. The tune, produced by David Axelrod, has a strong driving beat, unlike most of David Rose's easy listening styled output. I was impressed and pleased to obtain a copy but I was more delighted when Marty sent me a CD of Jack's original recording, entitled "Surf Finger" aka "The Blowup". The two titles perhaps illustrate the ambitions for the tune. "Goldfinger", the second James Bond film, created a big stir in '64, while '66 was the year of Antonioni's "Blow Up", one the most acclaimed movies of that year. Certainly, the scope for a listener's imagination and the power of the track would have been perfect roaring from the cinema speakers. Its a classic silver screen recording yet to hit the silver screen - give it time! How David Rose got to cover the tune remains a bit of a mystery. Marty thinks that Jack's proposed release of the track was scuppered because of Capitol overtaking Reprise to the pressing plant. But the Capitol release didn't come out until '67, by which time Jack had long since moved onto other projects and artists. It would appear to be a recording left in the can from the "Senorita From Detroit" session, hence the 'Finger' but even so, the mystery remains as to how David Rose got his hands on the track. The recording bears too many similarities for David Axelrod not to have heard the original. Marty would have remembered if he'd played the tune to David. Maybe Jack did. Later in '65 Jack arranged and produced one final Marty Cooper composition, "Happy Birthday Blue", originally recorded by the Victorians. The version recorded by Joni Lyman was used as the b-side of her recording of "I Just Don't Know What To Do With Myself" for Reprise. I love the song and on its original '63 release, I would say it was in keeping with similar songs of the time, but by '65 it would have sounded dated. Jack and Marty had both moved onto other projects. Perhaps it was a way of saying goodbye.